Last week we discussed Internet Explorer 7, the latest browser offering from Microsoft, and decided that whilst long overdue did go some way to addressing the functionality gap between the rather dated IE 6 and newer alternatives such as Opera and Firefox. Not wanting to be outdone Mozilla today released the latest version of its browser, rather imaginatively entitled ‘Firefox 2.0’ which once again ups the stakes in the long running browser wars.Since I have talked about features such as tabbed browsing many times in the past I will today focus purely on the differences between version 2 and version 1.5.For those of you that missed my review of 1.5 towards the beginning of this year please remember that it can be found on the free Click archives website at www.computerarticles.co.uk. The most apparent change in the new version of Firefox is the interface which includes new shaped glossy icons, reorganised windows and a slightly clearer layout.Of course there is a limit to how much you can change the appearance of a browser but generally the interface is just that little bit more pleasant to use now.Tab browsing has been enhanced so it is now easier to manage open tabs and individually close down single tabs that you are currently using.Additionally, you are now able to reopen accidentally closed tabs from where you left off which is an extremely useful feature as I have discovered several times today. Protection has been added to the browser by the way of advanced anti-phishing security which pops up whenever it detects that you are visiting a webpage trying to imitate official sites such as Barclays.com in an attempt to steal your personal details.This utility checks against the regularly updated Google black list to provide maximum protection.With technologies such as this becoming commonplace in new browsers hopefully it won’t be long before we put the scammers out of business. Firefox now includes a spell checker which checks the text entered by a user in to any multiple line text boxes for any spelling mistakes.Whilst this won’t be popular with those who write in ‘text speak’ I personally welcome the new addition as not only will it hopefully encourage affected individuals to become more literate, it will also make life easier for the rest of us. For those of you still using Firefox 1.5 it is worthwhile noting that whilst support will be provided in the form of updates for the next 6 months that there really is no argument against upgrading immediately. 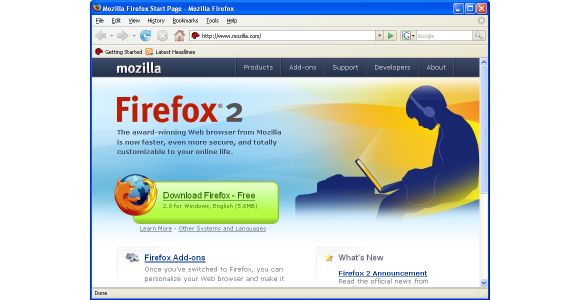 Visit www.firefox.com and download the latest version this afternoon – It will take you literally a couple of minutes and the new features and enhancements will definitely make it worth your while.